It is said that the Japanese love to bathe. From places to cleanse the body and mind, to spaces where people have gathered to socialize and recuperate, Japan's bathing culture and baths have developed in a unique way. "Traditionally, Japanese people have learned that onsen (natural hot springs) can have various healing effects on the body and soul," explains Reiji Iizuka, a certified Onsen Sommelier Ambassador. Just like with wine, the Onsen Sommelier Association provides courses for hot spring enthusiasts. 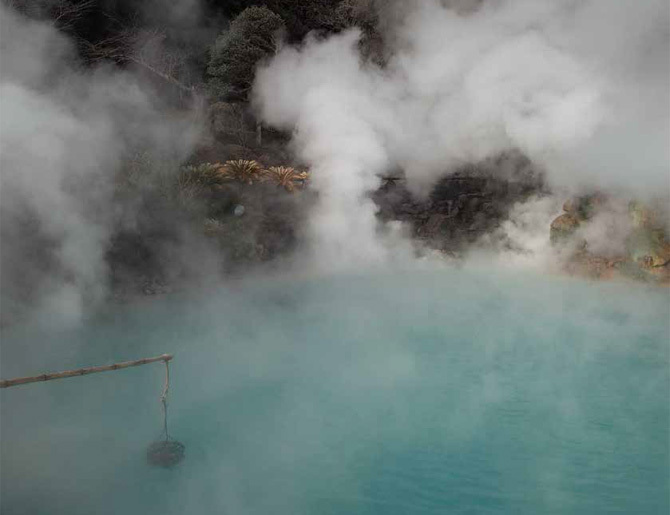 "Japan is blessed with many onsen because of the large number of volcanoes," Iizuka continues. "On top of this, summers in Japan are hot and humid, and winters are dry and cold. Our springs are colored by flowers and new growth, and our autumns are filled with the beauty of turning leaves. The climates of the four seasons add to the enjoyment of bathing in onsen." "I believe the bath at home is the closest way to re-experience onsen. By cleaning the body, you feel refreshed. By relaxing and resetting your stress levels, you feel reborn. This is what the bath means to Japanese people." In 2017, LIXIL marks fifty years since it first began mass-producing prefabricated bathrooms in Japan. There's no better time to look back at how baths in Japan developed, at how the times are changing, and at the bathroom spaces LIXIL strives to create. © Yasuhiro Okawa There are over 3,000 onsen in Japan, a country dotted with active volcanos. To date, the earliest archaeological traces of onsen can be found in the ruins of the prehistoric Jomon period. And while wondrous but unverifiable myths and legends continue to be passed down to this day about various onsen, they first appear in writing in the "Kojiki" (Record of Ancient Matters) from 712 and the "Nihon Shoki" (Chronicles of Japan) of 720. Based on such manuscripts, Arima Onsen in Hyogo prefecture, Shirahama Onsen in Wakayama prefecture, and Dogo Onsen in Ehime prefecture are said to be among the oldest. The records imply some onsen were used for healing. Written in the "Izumo Fudoki" of 733, the people of the time referred to Tamatsukuri Onsen in Shimane prefecture as the "the water of the gods." The text notes: "bathe in it once, and your body will shimmer. Bathe in it again, and all of your illnesses will be healed." It was under the influence of Buddhism in the 6th century, however, that the culture of bathing expanded in Japan. Buddhism taught its followers about the merits of bathing and cleaning the body. During the Nara period, temples such as Todaiji and Hokkeji even provided baths for poorer people. These were not the hot-water baths we know today, but steam baths that helped cleanse the skin and eventually led to the appearance of Japan's sento (communal bath) culture. By the Edo period (1603-1868), the custom of bathing was more widely spread and enjoyed. Sento had become places of relaxation. Hot water foot baths were eventually added to steam baths, in addition to "closet baths" (saunas) in which one would sit and steam the upper body. By the Meji (1868-1912) and Taisho (1912-1926) eras, Japan's sento were closer to what they are today, with baths that enabled one to soak up to the shoulders in hot water. While Western influences impacted various aspects of life from the Meiji era onward, Japan's bathing culture, which includes washing the body in a separate space before soaking in the bath, continued to develop independently. At the start of the 20th century, while baths at home were still mainly made of wood and iron, tile baths became more popular alongside the development of tile manufacturing. Even during the first half of the Showa (1926 – 1989) era, though, baths at home were still limited to more affluent families. It was only until after the Second World War when baths finally began to appear in general households. The sudden demand for new housing spurred the need for shorter, simpler and high quality mass-production processes. It was at this time in 1967, that LIXIL began to develop and mass-produce prefabricated bathrooms, helping to popularize the bath at home in Japan. Today, LIXIL aims to do more than offer simple bath tubs. "We are always looking provide bathroom spaces that provide new lifestyle value," says Shuji Fukao, General Manager of the Bathroom Division at LIXIL. "And to determine what the customer needs, you have to not only understand their social and cultural background, but also what each individual is looking for." LIXIL's products are based on the detailed observation of consumer behavior. For example, it analyzes what users seek in onsen. Some are there for the effects of the minerals on the body, while others are drawn for cosmetic reasons. Some come for the sights of the mountains and sea. Based on these insights, LIXIL's researchers identify how to add value and match it with advanced technology. It was through this process that LIXIL developed SPAGE in 2014, a product concept that brings the spa experience into the home. Hot water cascades down the shoulders in the bath tub, while LIXIL has added features to stimulate the senses, including imagery and sound. In March, 2017, the company also fully remodeled its ARISE series of prefabricated bathrooms in response to the evolving bathing habits of Japanese people. This included upgrading to an overhead shower. Observations have shown that the users who are raising children and caring for elderly are increasingly opting for quick showers. Made possible by integrating the larger showerheads of LIXIL's GROHE brand and redesigning the sliding bar for the showerhead, customers now get the full overhead shower experience - whether standing up or sitting down. ©HOUSE VISION But LIXIL's researchers have their sights set on the future, too. Since its founding, the company has worked with architects and designers to develop products that fuse function and aesthetics to match the lifestyles of the time. 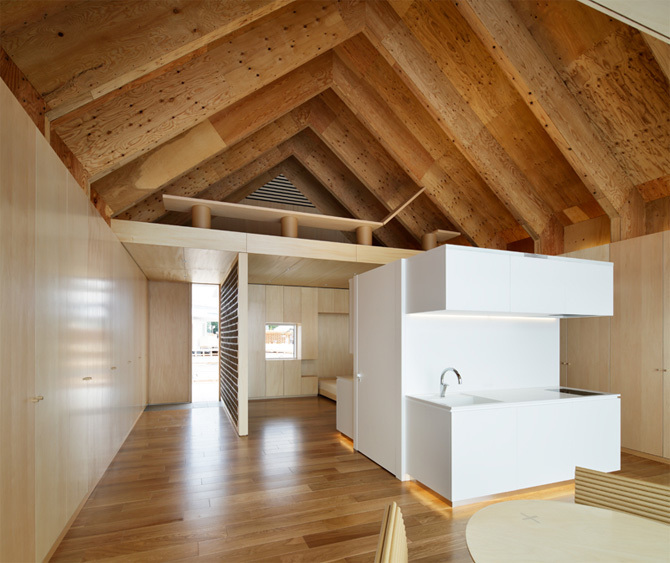 In the summer of 2016, it partnered with internationally acclaimed architect, Shigeru Ban, for HOUSE VISION 2016, an exhibition for houses of the future. As part of this, LIXIL developed a unit called LIFE CORE, which combines home facilities such as the kitchen, bath, toilet, air conditioning, lighting and electricity into a single unit. The unit simplifies planning and construction since it can be installed anywhere in the house. This is an example of looking beyond conventional water technology solutions to enable a more comfortable living in the future. And Fukao is upbeat about the future. "Japan is a country of onsen and volcanoes, and we are grateful for the blessings that nature has provided us and cherish the culture that it has cultivated. LIXIL has mass produced prefabricated bathrooms in Japan for 50 years, and now we look forward to yet another 50 years of innovating bathrooms to meet the changing lifestyles of the people in Japan."